Experience Portland From the Water! Be your own captain and rent a 21 ft. electric Duffy Boat. 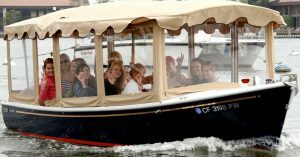 Each boat holds up to 10 passengers of all ages. Bring your own food, drink, alcohol and play your own tunes on our jamin’ sound system. Have a party on a boat—romantic outings—corporate events—life celebrations—and waterfront festivals! Experience breathtaking views of the city, eco wonders, wildlife, historical bridges, floating homes and more. No experience or boating license needed. Anyone 21 years or older with a valid drivers license can drive a boat. Would like to know more information about pricing. Thank you.